Even with some recent rain, California’s drought grinds on, and health officials say 17 communities could run out of water within the next four months – or sooner. One of those, an hour north of Los Angeles, is the town of Lake of the Woods, perched above the Tejon Pass. At Our Lady of the Snows, parishioners have been praying lately for the thing their church was named for. Father Sidath Wilegoda is the parish priest. Thursday’s rain answered those prayers - somewhat (rain but no snow). But it won’t buy much more time for this town of 900. Lake of the Woods has relied on well water since Mrs. Florence Cuddy subdivided her land, creating this town in 1925. “Last year we were doing fine. The wells were doing fine. and now, you know, they’ve gone down dramatically,” said Bob Stowell, chairman of the Lake of the Woods Mutual Water Company. One of the company’s consultants estimates Lake of the Woods has lost 70 percent of its supply. Last summer, the water board knew trouble was coming when surveys showed the wells were draining faster than expected. They tried sinking new wells. All came up dry. The effort sapped the financial reserves of the water company. Lake of the Woods could be a victim of location. It shares groundwater with several other water districts, some lower in elevation. “The water follows faultlines and stuff like that, so it’s naturally draining downhill,” said Raphael Molina Jr., the operations manager for Lake of the Woods. Molina works for Lake of the Woods and Krista Mutual Water Company part time. His full time job is for the Lebec County Water District. On his belt is a fat ring of keys for trucks, offices, and locks around wells. Lebec sold water to Lake of the Woods last summer. Lake of the Woods trucked it up hill and delivered it to homeowners’ tanks. This year, Molina says, that might not happen. Lebec has its own problems. Molina is a babyfaced 23-year-old with five years of experience in the region’s water geology under his belt. He’s getting experience in human psychology, too. When Lake of the Woods declared a water emergency last summer, Molina went door to door to tell residents. At one house, a man shouted at him, and “got in his face.” A woman tore up the emergency notice. Property owners all pay around 45 dollars a month for an unlimited supply of water. Even with little incentive to conserve, Marillo says most people she knows are taking care to cut their use. Still, she’s never heard a water alarm this loud, this early, before. Town water managers hope that doesn’t happen. A contract with the state will give them around $240,000 towards sinking new wells. They’re looking into other federal and state funding opportunities, too. At a meeting this week, water board members hung on every word from a hydrogeologist. Consultant Ken Schmidt pointed out on maps where he thought test wells might succeed. “From your maps here does it look assuring that there is deep water down there?” one board member asked. Locating areas likely to have water is a science, but pinpointing the location to actually sink a wellhead is more of an art, and sometimes just a guess. Dave Warner’s company, Self-Help, is helping the town raise money for the new well. I ask, if the Lake of the Woods water company was a horse, would he bet on them. Dave Warner answers immediately. “Yes, because they’re running. If they weren’t running all bets would be off. But they’re running,” he laughs. They’ll have to run fast. 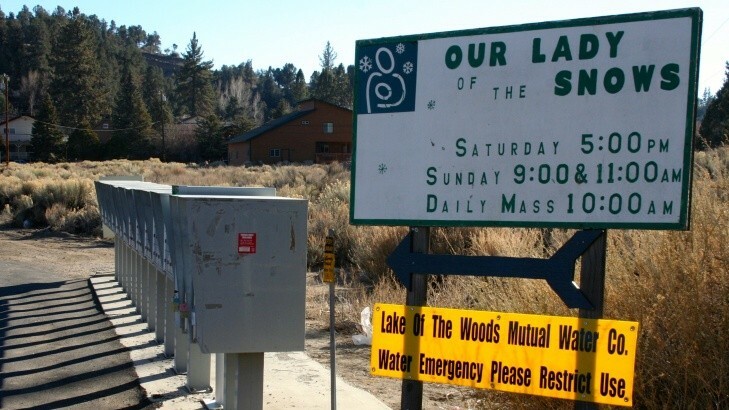 The state estimates the current wells at Lake of the Woods could run dry by May. This story originally appeared on KPCC.